You and your spouse have decided you need to do some estate planning, and you’re finally sitting down with an attorney to do same. He or she starts talking about a will for you and a will for your spouse. A trust for you and a trust for your spouse. And a . . . . In brief, here’s what’s up with that. 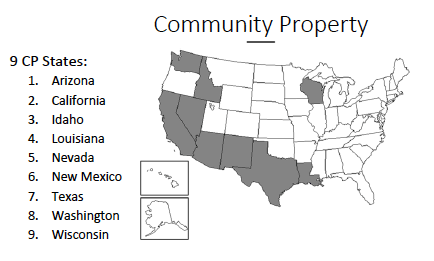 First, if you live in a community property state and you’re married, the joint trust is almost certainly the way to go, both to preserve the community property character of property contributed to the trust and to take advantage of a 100% step-up in the basis of the property on the death of either spouse. That is, when a spouse dies, property in the hands of the surviving spouse has a basis for tax purposes of the market value of the property at the date of death. For example, suppose the couple bought the property for $100,000 ten years ago. On the day before the death of the first spouse, the property was worth $500,000. If they had sold the property on that day, they would have a capital gain of $400,000, a gain they would have to pay tax on. Now suppose they didn’t sell and the first spouse died. On the day after that death, the surviving spouse could sell the property for $500,000 and pay no capital gains tax because the basis in the property had “stepped up” to the market value on the date of death–$500,000. Voila! For separate property states, the question of joint trust vs. individual trust is not so clear. If a married couple has lots of jointly owned property, the joint trust may still be the best choice. May. But if the couple has little jointly held property or if one of them has asset protection concerns–a doctor maybe?–then individual trusts are probably the better choice. Unmarried couples? Individual trusts all the way because of big gift tax issues caused by no unlimited marital deduction, a deduction available to only married couples. Image courtesy of Wealth Counsel.